Hi Y'all: This is where I am on the cream strips...I am about 3/4 through the strips, so however many blocks can be made from the materials I have is how many blocks I will make. I think probably 30 blocks...I have some old lace and buttons and pretties to put on the blocks, and I will decide on that a little later. (Why is this underlined and blue?) I have no idea...being a computer neanderthalette! Nine patches!! These arrived from Carol in Arizona...aren't they just so gorgeous!? I love them...and Carol spoiled me and made a wonderful pincushion. Thank you so much, I really love it, Carol! Her points all match...how do people do that on each and every point?? Isn't this just so pretty?? A big part of this nine patch exchange was to get to know my fellow quilting bloggers better, and that has been great fun. Carolyn of Iowa sent these above....such cute little nine patches!! Tied with string, like an old fashioned parcel. She also sent her patterns!! She has her own pattern company, Lee Prairie Designs. How fun is that!! Work has been busy with the new computer system, but OK, I am learning a lot about it and it has great capability. One patient I had recently (alert and oriented, mind you) decided to kick me in the stomach and head when I was bending over...sigh...I long for a sweet little old person to care for in times like that!! Otherwise, I still don't know about the move, and whether I will have a job. I am praying that I will end up where I need to end up, and I know I will. Nerves. When I am stressed out nervous, I eat. That is not good, especially because I eat mostly carbs and junk, and not lean protein and veggies. So, to counter that, I ran outside for the first time in about 3 years. The doc told me not to run after my back surgery, because he had to take out some vertebrae pieces in order to move the disc fragments off my spinal nerves. So, I have been walking pretty religiously...but today! I decided just to try a small jog, so went about a mile...and loved it! I forgot how good I felt after exercise...so sweating and panting, I walked the rest of my route to home...yahoo! I am so glad! Hi all: I finally had enough of skipping project to project...and buckled down, FOCUSED!, and finished the spool (klosjes) top. I loved all the variety of fabrics, and as I have said, this is a complete catalog of each reproduction fabric I have! Some of them used up all the fabric I had...and that is just fine! Joan, my blog friend, exchanged blocks with me...and I set the quilt like hers. Those blocks are precious to me. Each block is 3 inches. I counted them, then promptly forgot how many I counted...I think around 250 or so. I think I am my own worst enemy sometimes...I thought really long and hard about why I am a quilter and what I really love...and it is the hand quilting and hand work that I just really love, so this is basted now and ready to hand quilt! Yippee! Sometimes I get ahead of myself and want to have lots of production...but is that really what I want? Or is the process more important than a pile of hurriedly made quilts that may or may not be kept or appreciated? I think it is for me!! Dear Jane: I made two blocks for your quilt today...that was quite fun, and I am almost done with row 5! There are only 13 rows, so I am making progress. How did you feel about taking all that time to hand sew all those baby blocks? Or was it a wonderful passtime in the Civil War times? I used the fabric that Lori (Humble quilts) gave me last week for one of the blocks...I love it! Jane, did you use some of your friends fabrics too? Darlene, I received your blocks today...with such great joy! Each one of prettier than the next...and such a lovely variety! I love each one! Thank you for the fabric too!! And Julie from California...Just look at what she sent too! Gorgeous!! Very pretty variety here too...in fact, each package is tremendously wonderful to open! Hi all: I am jumping around project to project...where is that focus from earlier this spring, when I finished so many big 'ol quilts? Anyway, I was straightening up the quilt closet, and found these 1.5 inch squares, so I made four patches. I love the littleness of them...now what in the world to do with them?? My picture is terrible...does not do this lovely object justice at all, but it is pink, and lovely, and a wonderful scissor fob made by Kaaren at the Painted quilt! She is a great talent...I love this...thank you Kaaren! Then I emptied the string bin, and was sorting these out...and little Rosie the poodle decided that the pile was an ideal place for a nap. And stayed there all morning! Sorry about the blurry shot...she is such a dolly, though! Anyway, I sorted out the cream/white/light string and made string blocks...Hmmm, the jury is still out on this, but if I quilted them in red and added a few scattered red hearts...hmmmm....?? What do you think? Maybe the trash bin? Or what?? Oh, Nine patch fun continues!! Joyful is really the word...look at what Kathy sent all the way from Ontario, Canada! Gorgeous lots of nine patches...little and big...gorgeous fabric too...wow! Thank you so very much, Kathy!! And the fun continues! Look at what Carol sent from Florida! I have to say...these nine patches are just so gorgeous! Isn't that hot pink just good enough to eat! She also included luscious background fabrics...thank you so much, Carol!! I am so blessed....I so appreciate each of you. 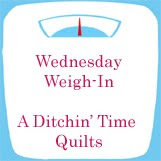 Each quilter adds their own charm and talents to the blog world mix...I am just so happy to know each of you readers, lurkers, quilters!!! You are very important to me. Hi everyone! I really love plaids, ladies...really love them. Lots of people don't because of the directional-ness of them and so forth... Well, you might have known...I saw this Pineapple blossom quilt block on a blog, in plaids...and decided that it was a must do for sure. I had lots of leftover plaids strips from my plaid quilt in my header, and decided to make a lap quilt out of the leftovers. Actually, I could make another plaid string quilt too and still have plenty...and probably will make it and give it to dear son. He seemed to like that one...anyway, isn't this block cool? And bonus triangles for the border too! Thanks to Bonnie Hunter of Quiltville, who supplied free patterns to everyone...I love this pattern of hers. I plan to make 20 blocks, and they are all cut out. You can see I work on the kitchen counter a lot...(dream) some day a sewing room! Anyway, these pieces of plaids were sent to me by my friend Joyce in Arizona. Do you see the little attached prints? This was a leftover part of a project that she sent me, and plus she sent a ton of plaid strips too. I immediately put them in "too precious to use and just admire" pile...until today. I cut the plaid pieces into 2 inch strips for the pineapple blocks, and the little attached pieces became 1.5 inch squares, for the 1.5 inch square bin. Neat plaids she sent huh? Don't you have a bin or box of plaids that are just crying out to be used?? This is your chance, LOL!! 2 inch strips....cut, cut, cut! fun!! And now.....a word to Dear Jane! Hi Janie....what's up girl? How in the world did you come up with this block? I love it! My favorite color and all, and it reminds me of the sun with rays of light...love it! I wonder if in the 1800's it was as hot as it is today, now...it is hot, Jane! How did you stay cool at all?? And now you know you have to hear about the nine patches...TADA!! Here are my finished nine patches...the three inchers....I love them and hope all the swappers do too!!! I have some doozies of stories about the weekend at the hospital, but will refrain...but wow, some people are just plain nutzola!! Hi Y'all!! It has been a banner week for mail around here...such fun!! Lori from Humble Quilts sent this gorgeous fabric...it just feels so soft and lustrous, and the picture does not show it justice...it is absolutely wonderful! thank you dear Lori! I plan to use a little of this in my Dear Jane quilt. Please visit her blog and leave a note...you will love her work! I have been at work for a century...or the last three days!! More amazing mail at our home...it has been so much fun!! Above are these gorgeous nine patches...aren't they so very pretty? These are from Mary at Quilt Hollow!! She is a wonderful quilter...and she included some backgrounds too...thank you!! You really need to visit at her blog...wonderful stuff there. Look! There are pockets for needles and a small pair of scissors and a piece of wool to put your needles...it is so very fun!! Thank you so much, Dear Kaaren!!! Cindy of Sew Cindy sent her nine patches...aren't they just so gorgeous too? I just love them! She sent this background too...thank you so much, and I am so glad for it!! Please visit her at her blog...she is just an exceptional quilter too. Well, this week....we implemented a new computer system at work, and it has been stressful, stressful!! Not only have we had really sick patients, but have been charting about 8 hours per 12 hour day...now just when are we supposed to take care of the patients? I am getting faster...and I know it will be easier...but I just had to whine a little. In the mean time, the staff that is rolling this new computer system out has been coming around with huge bags of snack sized candy bars....and (head hanging in shame)....I have eaten 6 of them! OINK, OINK went the little piggie! Stress is a big trigger for me and eating...how about you?? This little piggie is back on the band wagon...and backing away from the trough!!! Hee!! I had a funny thing happen the last day I worked. We have a n incredible, very large group of volunteers at our hospital, and we just couldn't function without them. I was walking out to the parking lot after work with one of them...she was maybe 75 years old, a very nice lady, a little grandmotherish. To my surprise, she hoisted her leg over the saddle of a great big Harley Davidson Motorcycle and roared off out of the parking lot! she gave me a little smug smile and wave as she left....I just find out more about this lady! What a surprise!! Look at these gorgeous nine-patches!! These have flown all the way from Canada...and they are gorgeous! Congratulations to Jennifer, she is the first one to have her 6 inch nine patches made...yahoo! She is the big winner! More prizes to come...Thank you for the wonderful quilt journal too! From Australia...Lyn...How cute is this angel? Thank you, Lyn!! The card is so special, it has texture...so you can feel the fabric/texture on the front...how unique is that? I have been tapping my toes to the fun music...dancing a little bit...just having a ball making nine patches for the swap! How about some funky bluegrass...a little country...some pop music...a little classical? All this fun music played today and infused into the stitches, LOL!! Here are my strips cut...about 10 minutes. I do things a little at a time, how about you? when I can grab a minute...or ten!! All the units paired up and ready to soar through the machine...fun! This is the fun part!!! How are yours coming along? I also did 9 more basket blocks today...and one dear Jane block. How could you? You made such a hard block, that mine came out terribly! I should redo it...but Jane, I did not like making it the first time, why in the world would I make it again, LOL??? I go back to work tomorrow...and we have a new computer system, and I hear it is horrible to chart on...I will reserve judgment for now, maybe it will be just fine!!! Terry of Terry's treasures had a give away of this book, and I was the lucky winner. I have now read it, and Terry and I have agreed to give it away again!! So, if you would like to win this book, just leave a comment on this post. That's it, just a simple comment will do! Thanks Terry, for the book! I will have a name drawn on August 19Th...my birthday, to celebrate! Y'all have a wonderful rest of your weekend!! Seems like I always have a little help when I am playing with blocks...and today is no exception! Here is where I am on the baskets...I made some progress this morning. Lots more colors than this will be included; this will be a long term project. I still have 8 more blocks cut out....maybe 200 or so in the quilt when it is finished. This is how many Klosjes I made! This is really an inventory...of every fabric I own. This is what I have. I will have to check, double check, triple check when I do the final layout...I found so many mistakes, misturned blocks, and colors too close together. I may enlist y'all to help me with that!! I am so spoiled, just want you to know!! Lyn of bluebird quilts sent me an early birthday present...wow, I am just delighted! You can't really see those gorgeous fabrics she sent, but they will all go in my Dear Jane quilt. Thank you so much, Lyn!! I at last have my own measuring tape, thanks to Lyn! Other than that, I have been sewing nine patches! And that is great fun...I will show you soon!! Whew! Long time no chat...I have been working, working...and then!! Dear husband whirled me off for an amazing weekend...in Lake Tahoe! It is so beautiful there...and a place I have always wanted to see. He loves, loves, loves old and antique cars, so we went to Reno and attended Hot August Nights...a huge car show and extravaganza! Think of the huge quilt show in Houston...it is like that, except the topic of interest is cars. We saw so many gorgeous cars, his (and my) mouth was watering! I loved Tahoe the best, it was just gorgeous. On the way, I appliqued basket handles to basket blocks...I have a lot cut out in different colors, but here is what I have so far. I love them! They are 4 inch finished. The red one was an experimental block...it may not be in the finished quilt...or it may, LOL!! Trisha of www.TLCstitches.blogspot.com recently had a binding tutorial, where you used two different fabrics and sewed the binding to the back, then turned it to the front to hand stitch. I absolutely loved this technique!! I plan to do this on a lot of quilts now...do you see the little pink strip? It is pieced into the binding...how cool, huh?? Caladiums are getting bigger...pretty! I love them. The bright green is my sweet potato vine...hey, does this really grow sweet potatoes? Or is it only ornamental...? Please see Mary's blog...for some reason, I cannot get her tutorial page to hop over to my blog, but she has the coolest technique for nine patches!!! The post is dated August 7th, 2010. Thank you dear Mary!! Nine patches are coming for the big swap!! Aren't these gorgeous?? I love them! They are from Susan in North Carolina, and she sent some amazing backgrounds too. I am almost totally out of backgrounds, so I am just tickled pink!! These are from Trisha in Washington...aren't they so pretty too? I just think this is like Christmas opening these packages...and I think you will too when all these get distributed!! And some wonderful fabric was included...thank you so very much, Trisha!!! Trisha also has a very cool way of making nine patches...please click on her name to view her blog. These nine patches are from Sweden...how cool, getting mail from Sweden! Louise made these...and they are amazingly pretty. She also included some fabric too...thank you! You all are so very kind to me. OK...confession time...I ate like a little piggie this week, but still managed to lose a pound. I am not sure how that happened...and I know it will catch up with me. Let's see what next week brings!! Have a wonderful day all!!! Look at what Libby sent!!!! She already has her nine patches done...and they arrived at my door yesterday. They are just so pretty, and make me so excited about getting everyone's blocks here and sorted and sent out to everyone! Libby...also sent chocolate! I have already sampled this yummy chocolate...it is so good! I have never seen it before...the packaging says it is from New England...it is delicious. Friendship is sweet! I am counting it in my weight watchers points...which makes it totally legal. I received the most wonderful winnings from Nola...she is generously sharing her stash from the 1980's...and these fabrics are just beautiful! And packaged so prettily...I just hate to open them up and use them! They are in the category of "oh too pretty to use!" Thank you, Nola! I will be out of pocket for a few days...work, work, work! I hope each of you has a wonderful weekend!! Hi Y'all!! Guess what? I am a guest blogger at Stash Manicure! I am so excited...maybe you can pop over and see! It will be posted tomorrow, 8-4-10. Get ready, get set, sew! I have all my strips cut for nine patches. I am so looking forward to receiving everyone's nine patches, sorting, and sending them out all over the world! Well, it is bad news bears....gained that pound right back this week! One week up, next week down...sigh... I think that certain times of the month are not good, plus eating out wonderful Mexican food does not help, LOL ! Onward and upward...can't let one week get me down. I have nothing quiltish of substance to show you, so I wish you a wonderful week!